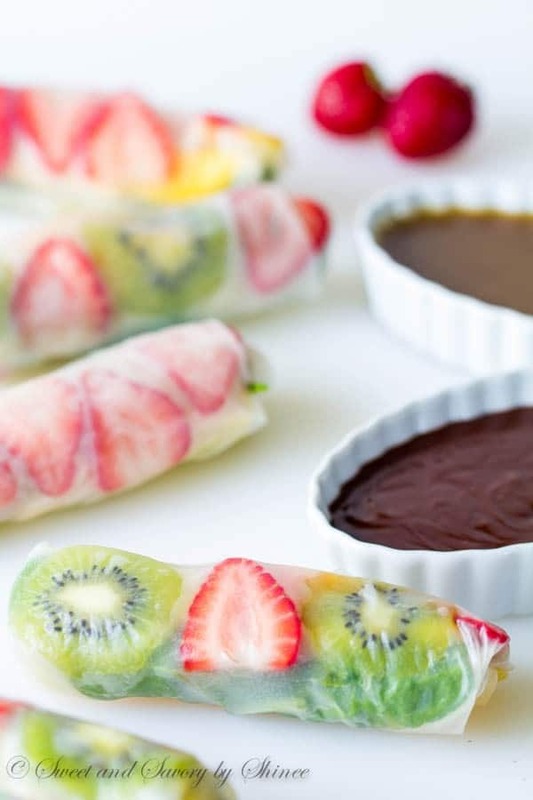 These rainbow fruit spring rolls are an ultimate summer treat for all the fruit-lovers, chocolate-lovers and caramel-lovers! Bonus, a fun video tutorial is included! It’s officially summer! 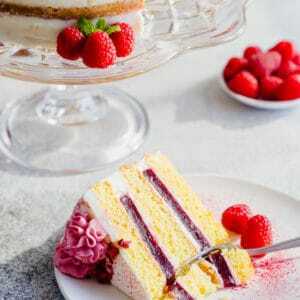 Let’s celebrate this fine occasion with loads of fresh fruits. Shall we? 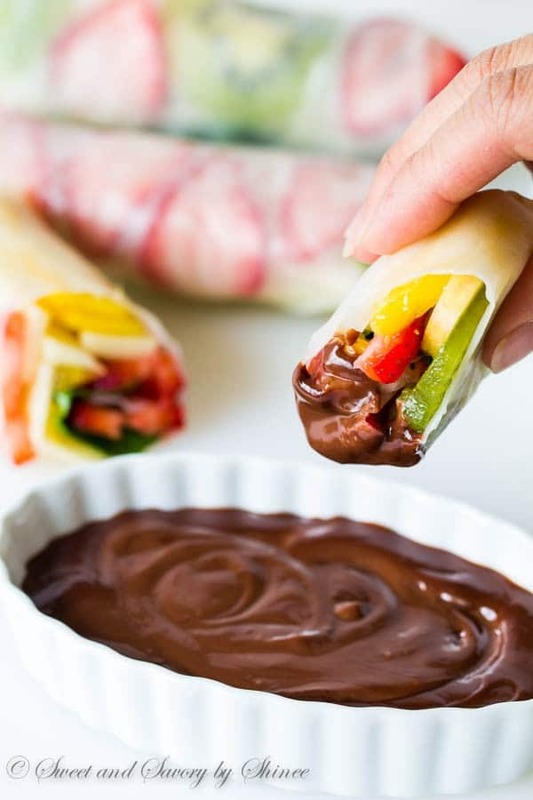 I’ve prepared for you these spring rolls loaded with amazing rainbow of fruits. 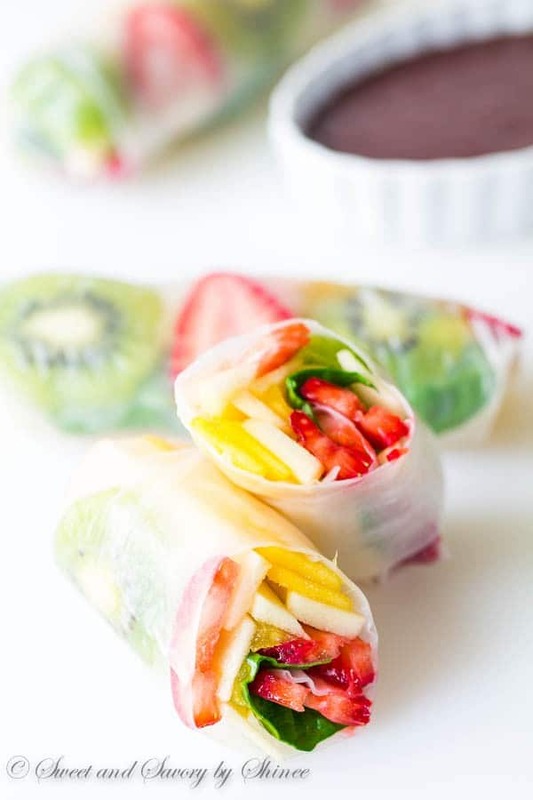 From crunchy apples to tangy kiwis, from sweet mango to strawberries, from healthy spinach to soft rice paper wraps. You’ll fine all things delicious and summary in these rolls. If you have ever feared of dealing with sticky rice paper wraps, rest assured you’ll have beautiful rolls in no time with my new video tutorial. My top secret to success is to prepare all the fillings first (duh!) and soak the rice paper wraps just long enough to get them pliable, yet firm! They get softer as you load your fillings and will be ready to be rolled up. If you soak it too long, the wrap will get sticky and hard to work with. Honestly, it was much harder to make this video than making these beautiful rolls! This is my very first stop-motion video. I had lots of fun, but that doesn’t mean it was easy. Whew, it took me a while to finalize it, but it’s here for you now!! Hope you enjoy it as much as I enjoyed making it. 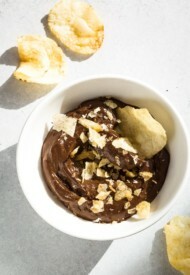 The best part of this dessert is the dipping sauces, of course. 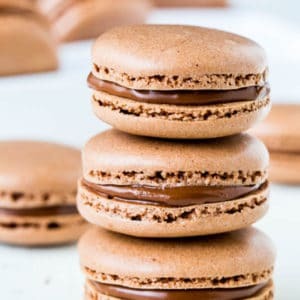 Decadent chocolate sauce, or sweet caramel sauce! Or both? The choice is yours. When my husband was taste testing these rolls, he first dived right into the chocolate sauce (he is a chocoholic, just like me). Then he said, “I don’t think you can top this combo!” Then he tried caramel sauce, and he was completely torn between the two! I’m telling ya, just make both sauces and enjoy! They are both divine. How are you celebrating the start of summer? Hull and slice the strawberries into thin slices. Peel and cut the kiwis into thin slices. Peel and cut mango into matchsticks. Quarter the apple, cut out the seeds and cut into matchsticks as well. Drizzle some lemon juice over the apples to prevent from browning. In a large pot, add warm water and soak the rice paper wraps for about 20-30 seconds, turning it as you’re turning the steering wheel. The wrap should be pliable, but still slightly firm, as it will soften while you put the filling. 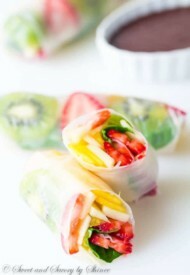 Put the rice paper wrap smooth side down and arrange the fruits on one half of the wrap, as shown in the video. 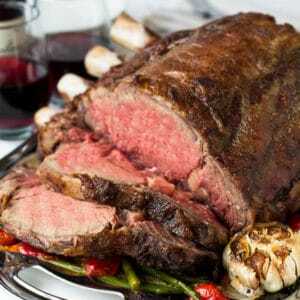 Fold in nearest end over the filling, fold in 2 sides of the wrap, and then tightly, but carefully roll it. 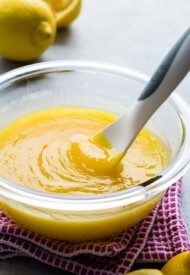 To prepare the caramel sauce for dipping, place the butter and sugar in a saucepan over medium heat. Melt the butter and stir until the sugar is dissolved. Add heavy cream and cook for about 5 minutes, whisking frequently. Add vanilla extract and salt. To make the chocolate sauce for dipping, heat the heavy cream in the microwave for 30 seconds or so. Pour it over chocolate chips and let it stand for a minute. Stir until smooth. 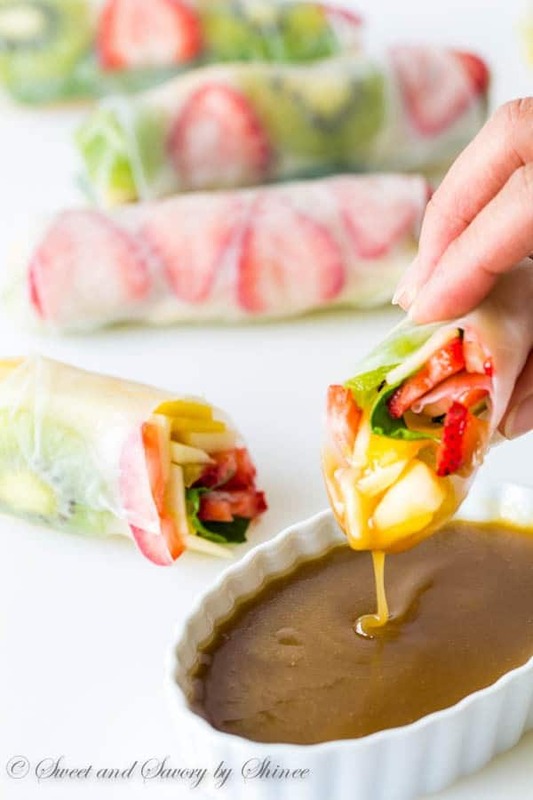 These look amazing – such a great take on a traditional spring roll! Would have never thought of making a dessert version but mmm! Great job on the video, too! Thank you, Shannon. The video was fun to make. 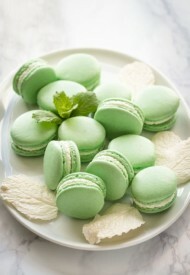 These look yummy and like something my book group would enjoy. How far in advance could I make these? 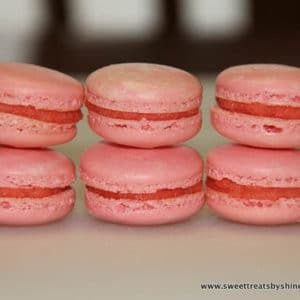 I am wondering if I could make them early and then just pull out of the fridge. Hi, Jane! These are the fresher, the better. When I kept some overnight for testing, the wrap become a bit rubbery/chewy. If you make it earlier in the day, I think that’d be fine. Just make sure to keep them in airtight container. Hope you enjoy. Um..yes! yes! and yes! I love that this is a lighter dessert. And that chocolate sauce. YUM! Yes, so fresh and summer-y and light. Thank you, Kristen! What a brilliant idea! my kids will love these. can’t wait to try! These are so fun and fresh! What a great snack idea! I once learned how to make traditional spring rolls from my friends mom – they were time consuming but so yummy! I love your take on soring rolls what a fresh and creative idea. Thanks for sharing found at Link Party Palooza. What a lovely video, Shinee! It was so fun to watch the fruit get all peeled and sliced up, and it was definitely helpful to see exactly how long you were dipping the rice paper in the water. 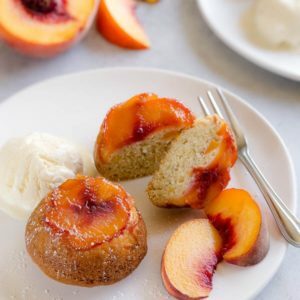 This is such a healthy and yet incredibly delicious finger food dessert to serve at a party. I can imagine dipping these beauties in both the chocolate and the caramel sauces. YUM! What a great idea! So fresh and healthy and beautiful to look at 🙂 I’m loving that chocolate sauce toooo! YEs, chocolate sauce is so absolutely good, Medha! So is the caramel sauce! 🙂 Thank you!